Jaw pain and clicking may be the result of muscle imbalance or traumatic injuries such as whiplash. There is pain associated with opening and closing the mouth. Hard foodstuffs can be difficult to chew. Grinding teeth when sleeping can worsen the problem. Difficulty opening the mouth fully can cause restrictions on eating foods such as apples, large rolls or big macs. It also makes it extremely difficult for a dentist to assess and treat any dental issues. Normal mouth opening ranges from 35-55mm. It is estimated that 80% of TMJ dysfunction is muscle related so a Chartered Physiotherapist, being an expert in muscle related problems is worthwhile consulting. A physiotherapy assessment will evaluate how well the joints open and close and the flexibility and strength of associated muscles. A TMJ treatment plan will then be put into effect.The aims of physiotherapy for TM Joint disorder are to decrease pain, improve function and normalize the joint mechanics. This may involve postural correction,advise on “sleep hygiene” , stress management/relaxation techniques, manual therapy,myofascial dry needling, exercises and advise on eating habits. It may be necessary to liaise with dentist to provide resting splints for use at night. Many TMJ patients also suffer from headaches. 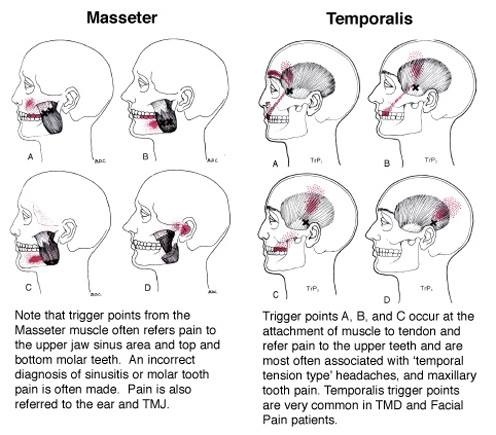 Tooth pain is also associated with myofascial trigger points in the masseter and temporalis muscle. Physiotherapy treatment of the TM joint can help with headaches, tooth and neck pain as these aches are often directly related to each other. Ann-Marie Ennis completed a specialist module in TMJ disorders as part of her specialized musculo- skeletal training in her final year in Trinity College Dublin. In 2017 she undertook further post graduate training in Physiotherapy Management of Temporomandibular Disorders . Bruxism is where somebody involuntarily or habitually grinds their teeth, which can be at night or during the day. The video below discusses the definition of bruxism, signs and symptoms, and treatment.